First Colbert, now Jon Stewart is leaving us...and millions mourn and wonder where they are going to get their news from. "After 16 Years, Jon Stewart Is Leaving 'The Daily Show.'" "A presidential election cycle looms, but one of the men most associated with covering presidential politics since the first election of George W. Bush won't be sitting in his usual spot: Comedy Central confirmed on Tuesday that Jon Stewart is stepping down later this year from his post at The Daily Show. "Stewart took over the show from original host Craig Kilborn in 1999, and under him, it became not just a popular comedy series, but a source of news and information for its audience, devoted in spirit if not enormous in numbers. Comedy Central will be hammered with speculation until the show's precise future is known, but the network said in its official statement that The Daily Show is a 'cultural touchstone' and vowed it would 'endure for years to come.' Presumably, that means they intend to find a new host, rather than replace the entire show with something else, as they did when Stephen Colbert left for CBS, The Colbert Report ended and Larry Wilmore's The Nightly Show debuted..."
"Jon Stewart to step down from 'The Daily Show' this year: Report." "Jon Stewart will leave The Daily Show by the end of the year, Politico reported on Tuesday. "The departure was confirmed by Comedy Central President Michele Ganeless in a statement. "'Jon has been at the heart of Comedy Central, championing and nurturing the best talent in the industry, in front of and behind the camera,' she said. 'Through his unique voice and vision, The Daily Show has become a cultural touchstone for millions of fans and an unparalleled platform for political comedy that will endure for years to come...'"
"These 5 Moments Show Why We’re Going To Desperately Miss Jon Stewart On 'The Daily Show.'" "...5 amazing moments from Stewart that show why we’re all desperately going to miss his wit, intelligence and his impact on our news. Every one of these articles has a video of the segment embedded in it, so I would definitely encourage everyone to check them out if you have a few minutes. 5. Jon Stewart Destroys Sean Hannity: ‘Your Special Brand of Spiteful Ignorance Will Always be Legal’: Any time Stewart went off on Sean Hannity it was must-see television. These are two men who I would pay to watch square off in a one-on-one debate. While on-screen animosity is sometimes faked for the sake of entertainment, there’s a clear disdain between these two. 4. Jon Stewart Remakes Koch Brothers Commercial So That It Actually Tells The Truth: A few months ago Stewart was a bit surprised to learn that the Koch brothers had been running advertisements during his show. I guess it makes a little sense. They’re worth tens of billions of dollars so why not waste a few to try to push their nonsense on an audience they normally don’t reach on Fox News? Well, Stewart had some fun with this advertisement, remaking it in such a way that it actually told the truth instead of the propaganda it was pushing. And I think it goes without saying that Stewart’s version was absolutely hilarious. 3. Jon Stewart Mocks Sarah Palin’s Iowa Gibberish: ‘Ma’am You’ve Got To Leave The Walgreens’: Besides George W. Bush, I’m not sure if there was ever a public figure more suited to be mocked and ridiculed by Jon Stewart than Sarah Palin. Her brand of idiocy is definitely one of a kind and any time he had a chance to express his feelings about something she had said or done, it was usually pure gold. 2b. Jon Stewart Crushes ‘Diseased Minds’ on Fox News: ‘F**k You And All Your False Patriotism!’: It’s not every day you see Stewart step a bit out of character, but in this particular instance you could feel how much he detested Fox News. He absolutely went off on the network’s hypocrisy for bashing President Obama for every small thing at every single turn despite the fact that we’re almost on the brink of another war – yet during Bush’s presidency they went after anyone and everyone who dared to criticize the president while the nation was at war..."
And what did Jon have to say about this? "Jon Stewart on his impending departure: 'This show doesn’t deserve an even slightly restless host.'" "Daily Show host Jon Stewart found himself facing emotions even he didn’t quite understand while announcing his upcoming departure on Tuesday night. "He proceeded through the rest of the show as usual, before informing the studio audience of the news, thanking Comedy Central executives for his 17-year run hosting the program. "'In my heart I know it is time for someone else to have that opportunity,' he said, drawing cries and gasps. He said no specific date had been set for his final show. "While he said he did not foresee himself missing being on television every day, he anticipated missing his staff. Stewart also did not name any specific plans for his post-show life, aside from one close to home. "'I’m going to have dinner on a school night with my family, who I have heard from multiple sources are lovely people,' he said..."
"Jon Stewart To Take Over For Brian Williams At NBC: 'He’s America’s Most Trusted News Anchor.'" As Brian Williams is likely to be stepping down later this year, television’s most trusted news anchor, Jon Stewart, will be stepping in. 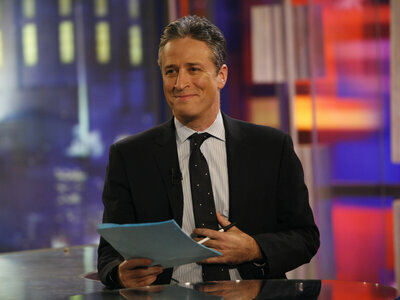 "This news has been confirmed by Stewart’s departure from The Daily Show. America knows and loves him, and cannot wait for him to begin his new adventure of delivering honest news to a broader market. "In what can only be seen as a rite of passage for Stewart, he’ll be filling some big shoes, but shoes he’s prepared to fill, with honest reporting and integrity. "Albeit Stewart will be missed in his Monday – Thursday time slot, there are several up-and-coming comic news anchors that will undoubtedly keep with the trusted journalism we’ve come to know and love from Comedy Central. "Stewart is said to be excited for his career move and is looking forward to an exciting future at NBC. "'He’s America’s most trusted news anchor, and quite frankly, we could use that about now.'" We're going to miss Jon. The viewers in the age group 18-24 is going to miss him the most, as they try to figure out where they can get their news now. Stewart wasn't a trouble maker and looked for common ground as much as possible...even when it wasn't possible. Conservatism suffered mightily at Stewart's hands, and as a legal entity with criminal ways they exercised their freedom of speech while decrying Stewart's Daily Show. If Conservatism was criminalized, comedians like Stewart and Colbert would still be pure comedians and not political ones. A toast to Jon and Steven!